This might be the case for a lot of people with artificial trees, but each year, my hands are black from dust after setting up the tree. Pre-move, I had decided that this year, I would rinse the tree in the bathtub before we decorated it. But then we got a garden. Because of the street-cat problem we have (they mark everything in our yard! ARGH! 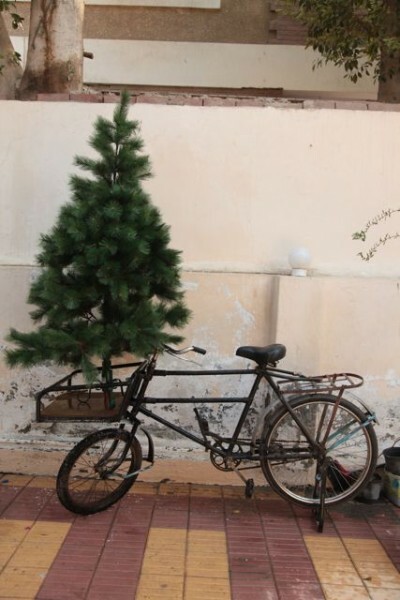 ), I set up the tree on the front end of our bike before hosing it off. This is my normal mode of transportation with the kids: They both sit up in the carrier frame where the tree is. Let me tell you, this bike is heavy, and cycling around 30kgs of kids is not easy. :P I don't know how much longer I can do it. If you look closely, you can see brakes along the handlebars. They don't work. The peddle in the up position in this photo is actually almost exactly in line with the footbrake. Very tricky to get used to, especially since you have to hike your leg pretty high to use it. I'll post a pic of us soon on the scooter...all of us. That is how we get around with J.
Wow, that's a lot of work to take the kids anywhere, isn't it? Be careful with the bike. I like how there's a small wheel in front to allow space for the basket. I hope you have a great christmas!